FREE! Product demonstration & free samples!! When Yasuo Kumoda came to the United States, he was charged with popularizing the Morinaga Nutritional Foods tofu. 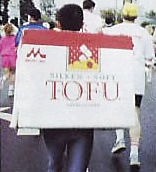 Kumoda discovered that in 1987, most Americans considered tofu as the least appealing food product, but he persisted. He ran a marathon carrying a product sign, sent tofu products to the White House, and discovered different ways that Americans could consume tofu. Come hear his story about how he overcame the odds to make tofu popular in the United States. This program is part of the Tateuchi Public Program Series, organized in partnership between the Atsuhiko and Ina Goodwin Tateuchi Foundation and the Japanese American National Museum. JANM . Last modified Mar 08 2012 5:46 p.m.